Perhaps one of the most popular free S60 applications ever is Calcium Calculator. 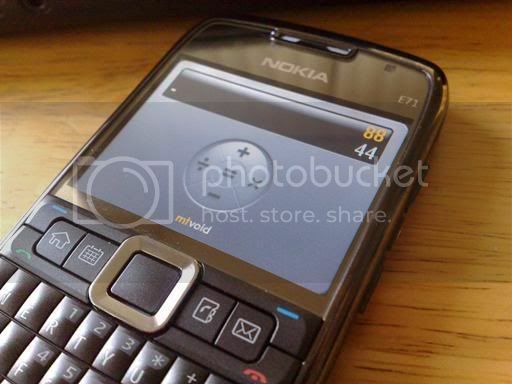 The simplicity of it and ease of use makes it so much nicer to use than the built in calculator and it works great on the Nokia E71. It gives you more of a one-touch feel compared to the built in calculator which makes you scroll around to the functions you are trying to use. Check out the photo of Calcium Calculator on the Nokia E71. Probably the only complain I have is the lack of calculations shown because it only gives you two lines in the number display. So this application is more for simple calculations. You might want to use the built in calculator if you plan on crunching out lots of numbers. Click here to download Calcium Calculator for your Nokia E71. Make sure you download the 3rd Edition version. Another good freeware calculator for E71 that support full keyboard. Hey thanks for that link. I'll check it out. Now to install Calcium set phones' date a year before. When I try to install on my e71 my phone crashes (I did reset the date on the phone). @anonymous: yup, same here. downloaded S60/3 Version, E71 freezes and only a battery-removal brings it back to life. On my E71 don't work digit 3 on this calculator. Using standard installed calculator you could just use the +,-,* and / as shortcuts to the different operations, you do not need to scroll to the operation and press select. I tried to install calcium calculator (on my 71) after upgrading my Firmware to 300.21.012 but error message pops up saying that 'Certificate Expired'. I also tried to install by resetting the date a year back, but still the same error. Before upgradation of firmware I could install calcium & it was working fine. Can any one suggest a remedy? Regards, Devi Prasad. Thanx for the Calcium Calculator. I successully installed it on my new E71. Earlier I used it on N73Music. Very great software. Thanxalot.